Is Your School’s Communication Becoming Irrelevant? I remember when I first heard of Facebook. I was talking to my sister on the phone, and she mentioned that a friend of hers had introduced her to this new website that allowed you to share photos, chat, and connect with friends and family. We’d heard of MySpace (back before it was about music and entertainment), but this was supposed to be different in the way it allowed you to control who did or didn’t see your profile. We were both stay-at-home moms, and the idea of connecting with other adults without having to line up a babysitter was so exciting that I created a profile right after hanging up the phone. Before I knew it, I had 100 grown-ups to talk to—it was liberating! I spent a few days’ worth of nap times making my profile look perfect, connecting with current friends, reconnecting with old ones, and posting photos of my babies (yes, those same demanding little people I was actually there to escape from for a little while). As far as I, and most other people I knew, were concerned, the newly dubbed “social media” was for nothing more than staying in touch with people I already knew but didn’t have time to physically talk to every day. I didn’t look to social media for daily news; I didn’t peruse my Home feed for recommendations and information about local businesses or schools; I certainly never thought I’d build a career around it! But here we are. The truth is social media has evolved into possibly the most popular form of online communication. And in an age when spreading the word about your brand via mailers, newspapers, and television has taken a backseat to online content marketing, there’s no denying: using social media to communicate and market effectively is not just a trend; it’s essential for success. Alright, it’s time to present you with the inevitable statistics (you knew they were coming). The fact is, according the Pew Research Center, 74% of American online adults use social media. Based on this number, there’s a good chance you use one or more social platforms yourself. But does your school? If your answer is no, then why not? If you had important, real-time school news to share and you heard through the grapevine that 74% of your parent population was hanging out in the school cafeteria right now, where would you go to make your announcement first? Well, of course that’s where you’d go! It’s estimated that nearly ¾ of your students’ parents are checking in with one social platform or another every single day (and often more than once per day). If you want to communicate effectively with your school community, shouldn’t you be there, too? You probably realize that social media is an essential marketing tool for businesses these days, but as a school administrator, maybe you think its usefulness doesn’t apply to schools. That’s the mistake many schools are making; they don’t recognize that in many ways, schools are in business! True, your bottom line is more about growing young minds than about making it to the cover of Forbes magazine. But like a business, you are providing a service, and you need a certain number of people to agree to allow you to provide them with that service in order to succeed. You are basically selling the idea of your school and the unique learning opportunities you and your staff provide there. With that in mind, many administrators are embracing the idea of creating a strong brand for their school. A well-thought-out brand gives your school the edge when it comes to everything from home and school communication to fundraising and marketing. Through that one, single image, you can communicate your promise to deliver on your mission as a school. Creating a memorable logo is only really useful, though, if you have a plan for sharing it effectively. Putting it on your school spirit wear and your website is a start, but if you ignore the boost your online image would get from having an active, well-managed social media presence, you’re missing out on one of the most widely-used tools the 21st Century has to offer for spreading your brand. The great thing about social media is that it’s about so much more than just sharing your logo—it’s about sharing your stories. It’s a storytelling platform where, because of its widespread use, sharing student and staff successes and opportunities translates to creating a reputation for school pride and transparency, which will often result in creating a growth in enrollment down the line. Remember how people used to play solitaire on their work computers during downtime? Well, now they’re checking their social pages for everything from updates about friends to articles on this year’s election. And yes, they’re also looking for advice on which school to select for their children. Chances are high they’ll search for you there, and not having at least one social page just might send them looking for a school that does. There are a number of school administrators who are still in denial about the necessity of getting their school engaged with social media, but you might not be one of them. It could be that what’s keeping you from joining the social ranks is simply that you’re not sure how to get started. If this describes your situation, we’re here to help. It might seem like social media users speak a different language (follows, likes, tweets, hashtags, etc. ), but all it really takes is a little time and persistence to become comfortable with the various social platforms. While it’s useful to research very specific social media strategies like content generation, social media campaigns, online safety, and targeted marketing down the line, those details won’t do you much good if you’re not even on the social scene yet. Choose the social platforms that fit your community’s needs. Manage your social presence effectively. Educate yourself about the different social platforms available to you, and choose one or more based on the needs of your community. For the sake of simplicity, let’s focus on what are arguably the most popular four platforms: Facebook, Twitter, Instagram, and Pinterest. The responsible creation and use of social media pages should be included in your school’s Internet Use Policy, so if you haven’t addressed this with your staff and students yet, check out Edutopia’s “How to Create Social Media Guidelines for your School” to get started. Administrators shouldn’t feel like they have to wait until they feel like experts in all things Facebook to join; just get in there! Social media is ever-changing, so think of it as continuing education. You’ll learn as you go, and there are tons of free online resources to help you along the way. And of course, we can always help! In fact, our free #Social4Schools eBook includes helpful videos that will walk you through setting up your pages. Be sure to include lots of pictures whenever you can (assuming you have the proper photo release forms on file for the students pictured). Photos increase the chances that your followers will interact with your posts, and that’s what social media is all about! Don't forget that driving traffic to your website should also be one of your social media goals, so be sure to include links in your posts to your school’s website pages often. That final step seems like a doozy, we know. In fact, besides perhaps not knowing where to start, knowing that social pages need daily upkeep to really be useful is probably the next biggest issue that keeps most administrators from making the commitment. Administrators and teachers have a lot on their plates already; how can they be expected to make time for this? 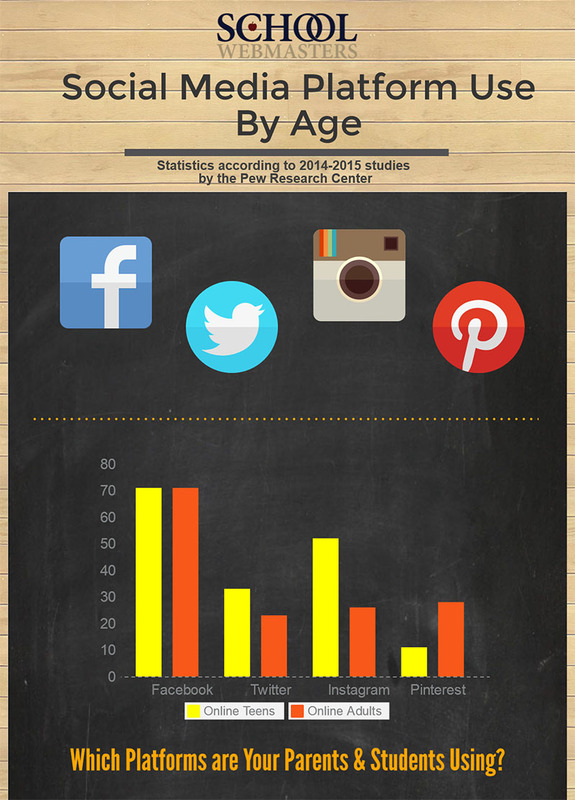 The fact is, social media has become an essential communication and marketing tool for schools. When businesses know they need something to succeed, but they don’t have the skill set or time to take care of it themselves, what do they do? They outsource. So if the time it takes to maintain a healthy online presence is the main reason your school is holding off, we hope you’ll remember that there are professionals who can help. Social media may have started out as a way for stay-at-home moms to connect with other adults during nap time, but it’s turned into an actual profession! School Webmasters offers expert social media set-up and management services to schools, allowing you the benefit of having a social media presence without having to do the work that comes with it. School administrators have a lot of demands on their time, it’s true, but helping to direct the stories the public hears and shares about your schools has to be one of them, and social media is an ideal way to do just that. If you’re proud of what’s happening at your schools—and we know you are—don’t hesitate to speak up and share those stories with pride! What’s more, be sure you’re sharing those stories where it counts. Your school’s students, parents, staff, and prospects are already using social media, not only to connect with friends and family but to stay involved in their communities and learn more about the local organizations they care about. So choose your platform, set up your pages, and get involved! Whether you have the resources to manage it yourself or want to partner with professionals, meet your audience members where they are! In return, you’ll earn respect from both your current and prospective communities and a reputation as a school that provides a quality education worthy of their support, their tax dollars, and their trust.